Personalise this My 1st Christmas Teddy Bear Stocking with a name up to 12 characters in length. The words 'My 1st Christmas' are fixed text. All personalisation is case sensitive and will appear as entered. Personalised name is heated on to the stocking to bind with the material. It features a hoop of ribbon on the top to enable the stocking to be hung. 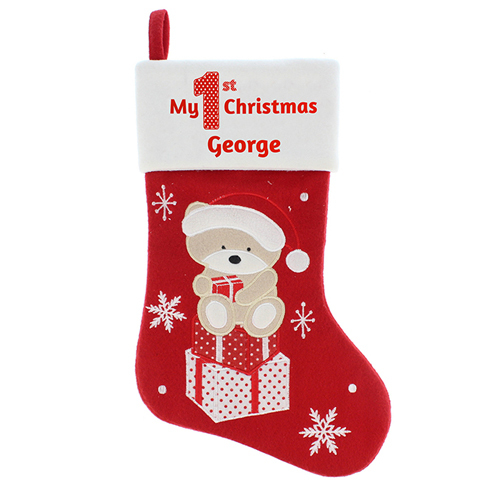 Personalise this My 1st Christmas Teddy Bear Stocking with a name up to 12 characters in length.